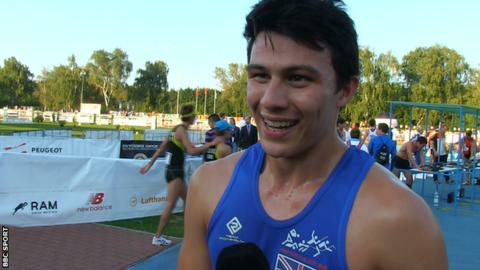 British pentathlete Joe Choong secured a Rio Olympic spot with seventh place at the Modern Pentathlon European Championships in Bath. Choong, 20, struggled in the fencing but attained the top-eight finish required for Olympic qualification. He joins pentathlon team-mate Samantha Murray and open water swimmer Jack Burnell in attaining named berths for next year's Games. Ireland's Arthur O'Keeffe won the European title with the gold medal. O'Keeffe, whose Rio place is secure, said: "It means the absolute world to me and hopefully I can go to Brazil and take the number one spot there too." A top-eight finish in the event at the University of Bath was the target for an Olympic place, and after qualifying for Rio, Choong said: "This means everything to me and I'm delighted. "My grandparents said they want to go to Rio and that it may be one of their last trips abroad, so I'm really happy to have that place." Frenchman Valentin Prades and Italy's Riccardo De Luca secured silver and bronze at the championships, which are being held at the University of Bath. Britain's Jamie Cooke led the standings after the swimming event and was in second place going into the shoot-run combined discipline. However, he missed out on Olympic qualification by just one place, coming 10th - five seconds behind Czech athlete Jan Kuf in ninth. On Sunday, Katy French, Freyja Prentice and Francesca Summers will look to secure Olympic status with top-eight finishes in the women's European finals.